Bristol Street Motors Hyundai Exeter marked the launch of its support of Exeter City FC by giving away an away shirt to a fan on Facebook. The Trusham Road dealership is supporting the League Two club into the next season. The team have played a key role in the local community for over a hundred years and fans hit social media to try to win the signed shirt. Lucky Exeter City fan Alfie Way took home the shirt after entering the competition, which featured on Bristol Street Motors Facebook page. The dealership has provided the League Two club with a Hyundai iLoad Crew van and will also be giving players access to a range of vehicles throughout the season which will help the team travel to and from training and matches. The Hyundai iLoad van features as part of the brand new Hyundai dealership and commercial van centre recently opened on Trusham Road in the Marsh Barton Trading Estate. “It was great to kick off the support by welcoming Alfie to the dealership to pick up the shirt – he’s a true Grecian! 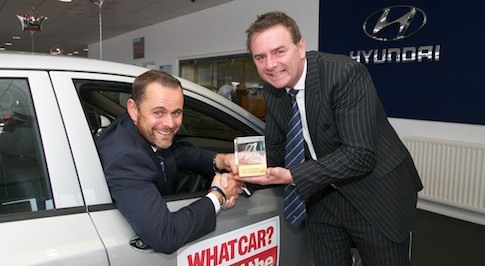 Mark Jenkins, head of commercial at Exeter City, added: “We are looking forward to kicking off the new season with Bristol Street Motors Hyundai Exeter on board.